Cisco Meraki MX Security Appliances are ideal for organizations with large numbers of distributed sites. Since the MX is 100% cloud man - aged, installation and remote management is simple. The MX has a comprehensive suite of network services, eliminating the need for multiple appliances. These services include Layer 7 application firewall, content filtering, web search filtering, SNORT based intrusion prevention, web caching, Intelligent WAN with multiple uplinks and 4G failover. The MX provides a complete networking and security solution that typically requires up to four appliances: branch router, next-generation firewall, Layer 7 traffic shaper, and CIPA-compliant content filter. This integrated architecture dramatically reduces up-front costs and ongoing support and maintenance. Moreover, it provides unified, single pane-of-glass management, speeding deployment and eliminating the need for specialized training. The Cisco Meraki MX is a complete networking and security solution, designed to make distributed networks fast, secure, and easy to manage. 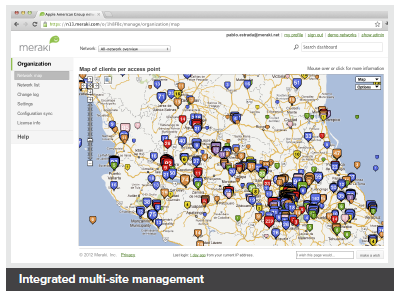 The MX is managed entirely through Cisco Meraki's web based dashboard. Designed with intuitive controls for IT generalists, the MX requires no training or specialized staff. The MX will even self-provision, allowing for remote branch deployments without on site IT. The MX hardware platform is purpose-built for cloud management, with CPU and memory resources designed to provide application and content-aware security at the edge. The MX's robust platform enables advanced features like layer 7 application traffic shaping, content filtering, antivirus/antiphishing, and site-to-site VPN, while providing the throughput and capacity for modern, high-density networks. The MX was designed for ease of use, even in branches without on-site IT. An intuitive interface, contextual help, and real-time support from the cloud eliminate specialized training. To deploy the MX in remote locations, simply connect the MX to the Internet, and it will securely self-provision from the cloud. Firmware upgrades, security patches, and signature updates are all delivered seamlessly from the cloud, ensuring that the MX is always up to date. Integrating broad security and networking features into a single intuitive device drastically reduces complexity in the branch. The MX eliminates costly MPLS tunnels with secure site-to-site VPN over redundant Internet connections. Using IPsec over the Internet, the MX links your branches to headquarters as well as to one another as if connected with a virtual Ethernet cable. Configuration headaches like NAT traversal are handled automatically from the cloud. The MX70's dual WAN ports with balancing and failover enable the use of redundant commodity Internet connections, providing more bandwidth and higher reliability than MPLS, at a fraction of the cost. Cisco Meraki's cloud management platform makes it easy to deploy secure, interconnected, centrally managed multi-site networks. 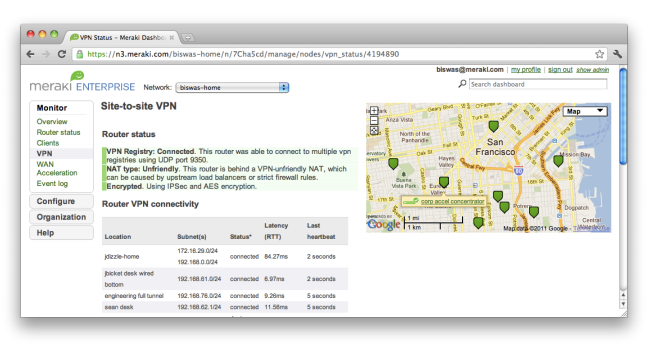 Add new sites in seconds with auto-configuring VPN. Centrally manage user, content and application-aware firewall policies across your entire network. Block unwanted bandwidth hogs like BitTorrent, and add capacity with WAN load balancing. Cache, deduplicate, and optimize traffic with WAN optimization to lower bandwidth consumption by up to 99% and improve application performance by up to 209x. 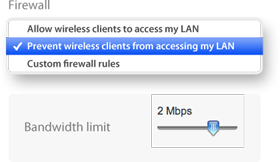 Automatically assigns firewall and traffic shaping rules, VLAN tags, and bandwidth limits to enforce the right policies for each class of users. Protects critical network resources from the latest security threats and vulnerabilities. Securely connects branch locations using mesh or hub-and-spoke tMopologies. Provides simple VPN access into Amazon Web Services and Microsoft Azure. Protect your network against malware using the latest threat intelligence, and identify previously unknown malicious files with retrospective detection. Provides device and connection integrity through multiple uplinks, warm spare failover, and self-healing VPN. Identify which applications are being used, and then prioritize critical apps while limiting recreational apps. Seamlessly manage campus-wide WiFi deployments and distributed multi-site networks from a single pane-of-glass. 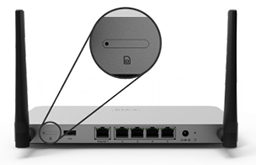 Cisco Meraki MX Security Appliances are ideal for organizations considering a Unified Threat Managment (UTM) solution, for distributed sites, campuses or datacenter VPN concentration. Since the MX is 100% cloud managed, installation and remote management is simple. The MX has a comprehensive suite of network services, eliminating the need for multiple appliances. These services include SD-WAN capabilities, application-based firewalling, content filtering, web search filtering, SNORT® based intrusion detection and prevention, Cisco Advanced Malware Protection (AMP), web caching, 4G cellular failover and more. Auto VPN and SD-WAN features are available on our hardware and virtual appliances, configurable in Amazon Web Services. Eliminates 6 complex appliances with a single, easy to manage platform. Application-aware traffic control: bandwidth policies for Layer 7 application types (e.g., block YouTube, prioritize Skype, throttle BitTorrent). Content filtering: CIPA-compliant content filter, web search filtering (Google/Bing), and YouTube for Schools. Advanced Malware Protection: file reputation-based protection engine powered by Cisco AMP. Unified firewall, switching, wireless LAN, and mobile device management through an intuitive web-based dashboard. Auto VPN: automatic VPN route generation using IKE/IPsec setup. Runs on physical MX appliances and as a virtual instance within the Amazon AWS cloud services. Interoperates with all IPsec VPN devices and services. Load balancing: combines multiple WAN links into a single highspeed interface, with policies for QoS, traffic shaping, and failover. 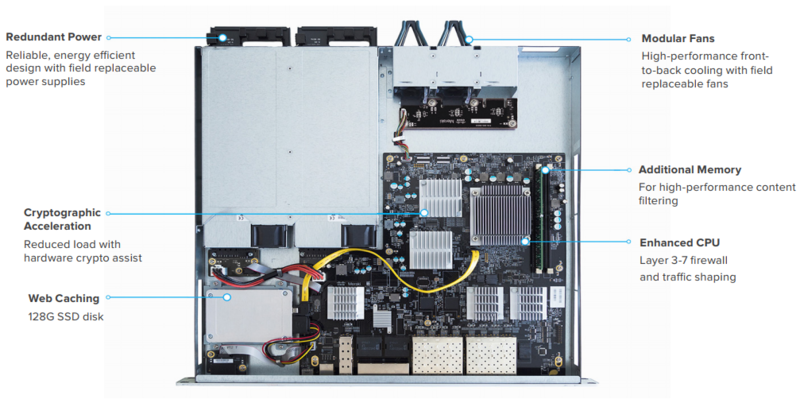 The integrated Cisco SNORT engine delivers superior intrusion prevention coverage, a key requirement for PCI 3.0 compliance. The MX also uses the Webroot BrightCloud URL categorization database for CIPA / IWF compliant content-filtering, Cisco Advanced Malware Protection (AMP) engine for anti-malware, AMP Threat Grid Cloud, and MaxMind for geo-IP based security rules. Software-defined WAN is a new approach to network connectivity that lowers operational costs and improves resource usage for multisite deployments to use bandwidth more efficiently. This allows service providers to offer their customers the highest possible level of performance for critical applications without sacrificing security or data privacy. Built on Cisco Meraki’s award-winning cloud architecture, the MX is the industry’s only 100% cloud-managed solution for Unified Threat Management (UTM) and SD-WAN in a single appliance. MX appliances self-provision, automatically pulling policies and configuration settings from the cloud. Powerful remote management tools provide network-wide visibility and control, and enable administration without the need for on-site networking expertise. Cloud services deliver seamless firmware and security signature updates, automatically establish site-to-site VPN tunnels, and provide 24x7 network monitoring. Moreover, the MX’s intuitive browser-based management interface removes the need for expensive and time-consuming training. For customers moving IT services to a public cloud service, Meraki offers a virtual MX for use in Amazon Web Services and Microsoft Azure, enabling Auto VPN peering and SD-WAN for dynamic path selection. The MX67W, MX68W, and MX68CW integrate Cisco Meraki’s awardwinning wireless technology with the powerful MX network security features in a compact form factor ideal for branch offices or small enterprises. While all MX models feature a USB port for 3G/4G failover, the MX67C and MX68CW include a SIM slot and internal LTE modem. This integrated functionality removes the need for external hardware and allows for cellular visibility and configuration within the Meraki dashboard. The MX65, MX65W, MX68, MX68W, and MX68CW include two ports with 802.3at (PoE+). This built-in power capability removes the need for additional hardware to power critical branch devices. APs, phones, cameras, and other PoE enabled devices can be powered without the need for AC adapters, PoE converters, or unmanaged PoE switches. 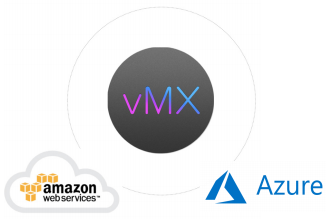 Virtual MX is a virtual instance of a Meraki security appliance, dedicated specifically to providing the simple configuration benefits of site-to-site Auto VPN for customers running or migrating IT services to the public cloud. A virtual MX is added via the Amazon Web Services marketplace and then configured in the Meraki dashboard, just like any other MX. It functions like a VPN concentrator. An Auto VPN to a virtual MX is like having a direct Ethernet connection to a private datacenter. The virtual MX can support up to 500 Mbps of VPN throughput, providing ample bandwidth for mission critical IT services hosted in the public cloud, like Active Directory, logging, or file and print services. Cisco Meraki MX appliances include a limited lifetime hardware warranty that provides next-day advance hardware replacement. Cisco Meraki's simplified software and support licensing model also combines all software upgrades, centralized systems management, and phone support under a single, easy-to-understand model. Cisco Meraki's cloud based management provides centralized visibility & control over Cisco Meraki's wired & wireless networking hardware, without the cost and complexity of wireless controllers or overlay management systems. Integrated with Cisco Meraki's entire product portfolio, cloud management provides feature rich, scalable, and intuitive centralized management for networks of any size. Cisco Meraki's hardware products are built from the ground up for cloud management. As a result, they come out of the box with centralized control, layer 7 device and application visibility, real time web-based diagnostics, monitoring, reporting, and much more. Cisco Meraki networks deploy quickly and easily, without training or dedicated staff. Moreover, Cisco Meraki provides a rich feature set that provides complete control over devices, users, and applications, allowing for flexible access policies and rich security without added cost or complexity. Cisco Meraki's cloud management provides the features, security, and scalability for networks of any size. Cisco Meraki scales from small sites to campuses, and even distributed networks with thousands of sites. 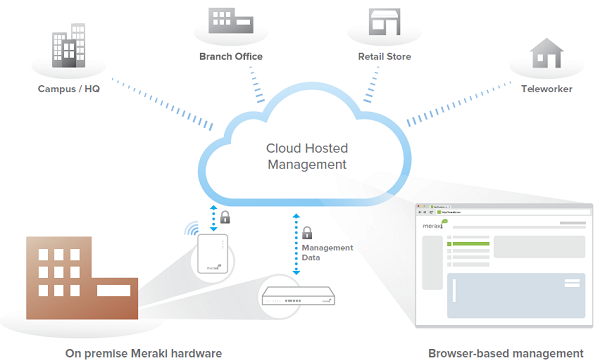 Cisco Meraki devices, which self-provision via the cloud, can be deployed in branches without IT. Firmware and security signature updates are delivered seamlessly, over the web. With the cloud, branches can automatically establish secure VPN tunnels between one another with a single click. With a secure, PCI and HIPAA compliant architecture and fault tolerant design that preserves local network functionality during WAN outages, Cisco Meraki is field proven in high security and mission critical network applications. Cisco Meraki's architecture provides feature rich network management without on-site management appliances or WiFi controllers. In place of traditional command-line based network configuration, Cisco Meraki provides a rich web based dashboard, providing visibility and control over up to tens of thousands of Cisco Meraki devices, anywhere in the world. Tools, designed to scale to large and distributed networks, make policy changes, firmware updates, deploying new branches, etc. simple and expedient, regardless of size or location. Cisco Meraki's real time protocols combine the immediacy of on-premise management applications with the simplicity and centralized control of a cloud application. Every Cisco Meraki device is engineered for cloud management. Specifically, this means that Cisco Meraki devices are designed with memory and CPU resources to perform packet processing, QoS, layer 3-7 security, encryption, etc. at the network edge. As a result, no network traffic passes through the cloud, with the cloud providing management functionality out of the data path. This architecture enables networks to scale horizontally, adding capacity simply by adding more endpoints, without concern for centralized bottlenecks or chokepoints. Equally important, since all packet processing is performed on premise, end-user functionality is not compromised if the network's connection to the cloud is interrupted. Cisco Meraki's cloud platform is designed to spread computation and storage across independent server clusters in geographically isolated datacenters. Any server or datacenter can fail without affecting customers or the rest of the system. Additionally, Cisco Meraki's datacenter design is field proven to support tens of thousands of endpoints. Cisco Meraki's cloud architecture delivers powerful insight and includes live tools integrated directly into the dashboard, giving instant analysis of performance, connectivity, and more. 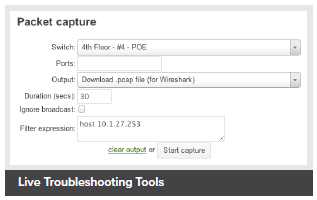 Using live tools, network administrators no longer need to go on site to perform routine troubleshooting tests. Visibility into devices, users, and applications gives administrators the information needed to enforce security policies and enable the performance needed in today's demanding network environments. Troubleshooting tools such as ping, traceroute, throughput, and even live packet captures are integrated directly into the Cisco Meraki dashboard, dramatically reducing resolution times and enabling troubleshooting at remote locations without on-site IT staff. Cisco Meraki's out-of-band control plane separates network management data from user data. Management data (e.g., configuration, statistics, monitoring, etc.) flows from Cisco Meraki devices (wireless access points, switches, and security appliances) to Cisco Meraki's cloud over a secure Internet connection. User data (web browsing, internal applications, etc.) does not flow through the cloud, instead flowing directly to its destination on the LAN or across the WAN. What happens if a network loses connectivity to the Cisco Meraki cloud? Cisco Meraki's cloud management service is colocated in tier-1, SAS70 type II certified datacenters. These datacenters feature state of the art physical and cyber security and highly reliable designs. All Cisco Meraki services are replicated across multiple independent datacenters, so that customer-facing services fail over rapidly in the event of a catastrophic datacenter failure. Cisco Meraki's cloud management is backed by a 99.99% uptime SLA. See www.Cisco Meraki.com/trust for details. 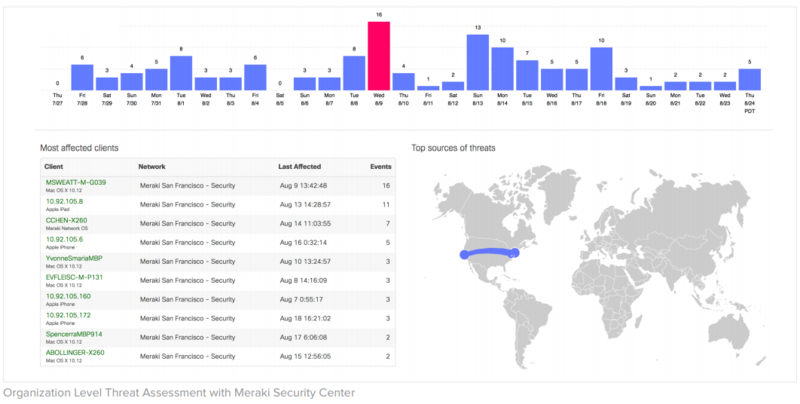 In addition to Cisco Meraki's secure out-of-band architecture and hardened datacenters, Cisco Meraki provides a number of tools for administrators to maximize the security of their network deployments. These tools provide optimal protection, visibility, and control over your Cisco Meraki network. Two-factor authentication adds an extra layer of security to an organization's network by requiring access to an administrator's phone, in addition to her username and password, in order to log in to Cisco Meraki's cloud services. Cisco Meraki's two factor authentication implementation uses secure, convenient, and cost effective SMS technology: after entering their username and password, an administrator is sent an a one-time passcode via SMS, which they must enter before authentication is complete. In the event that a hacker guesses or learns an administrator's password, she still will not be able to access the organization's account, as the hacker does not have the administrator's phone. Cisco Meraki includes two-factor authentication for all enterprise users at no additional cost. Role-based administration lets supervisors appoint administrators for specific subsets of an organization, and specify whether they have read-only access to reports and troubleshooting tools, administer managed guest access, or can make configuration changes to the network. This minimizes the chance of accidental or malicious misconfiguration, and restricts errors to isolated parts of the network. The Cisco Meraki system can automatically send human-readable email and text message alerts when configuration changes are made, enabling the entire IT organization to stay abreast of new policies. Change alerts are particularly important with large or distributed IT organizations. Cisco Meraki logs the time, IP, and approximate location (city, state) of logged in administrators. A searchable configuration change log indicates what configuration changes were made, who they were made by, and which part of the organization the change occurred in. Cisco Meraki accounts can only be accessed via https, ensuring that all communication between an administrator's browser and Cisco Meraki's cloud services is encrypted. 30 seconds before being logged out, users are shown a notice that allows them to extend their session. Once time expires, users are asked to log in again. Cisco Meraki MX appliances include a limited lifetime hardware warranty that provides next-day advance hardware replacement. Cisco Meraki's simplified software and support licensing model also combines all software upgrades, centralized systems management, and phone support under a single, easy-to-understand model. For complete details, please visit meraki.cisco.com/support. 3 The maximum concurrent VPN tunnels are based on lab testing scenarios where no client traffic is transferring over the VPN tunnels. An organization must have a valid Enterprise Edition license or Advanced Security Edition license for the MX series in order to work properly. Each organization is licensed for a maximum number of security appliances for a certain amount of time (typically from one year to five years). Build an easy to deploy and reliable network that doesn't require costly solutions like MPLS tunnels. Deploy the MX60 in missioncritical networks using link failover. Simplify access and visibility through cloud-managed site-to-site VPN. Secure remote networks using advanced security features like anti-virus filtering. Optimize network costs using traffic shaping. The MX series are equally indispensable when deployed behind an existing firewall and router. Optimize network traffic with application-aware (layer 7) traffic shaping and firewall. Prioritize mission critical applications or VoIP traffic while setting limits on recreational traffic, e.g. peer-to-peer applications. 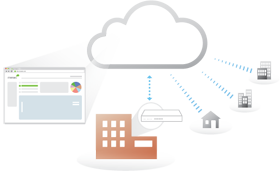 Discover all client devices, identify users and monitor printers. CloudWifiWorks.com is a division of Virtual Graffiti Inc, an authorized Cisco Meraki reseller.